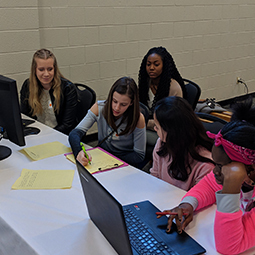 A group of 64 girls aged 10-18 used STEAM skills in the GeoDome Theater in an immersive storytelling experience at the STEAM Summit for Girls, held March 10 in Milwaukee. 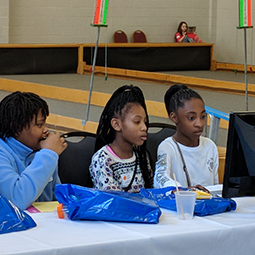 We partnered with VR content creators Custom Reality Services for a hands-on workshop incorporating all the elements of STEAM. The girls began with writing stories on the contributions women have made to astrophysics from ancient times through the present day. They acted in, directed and narrated 360 video pieces to tell their stories. 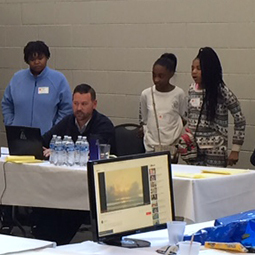 The girls then worked with our WorldViewer software to incorporate their videos into an interactive show for the GeoDome. They added astronomy visualizations using WorldWide Telescope, which provided a deep dive into astronomy and astrophysics. They used OSC commands in WorldViewer to script data-based stories using visualizations, and math skills helped them figure out video stop and start points. The GeoDome was packed to overflowing with an excited audience as we showcased the final product. We were honored to contribute to the Summit, which was held in Milwaukee on March 10. 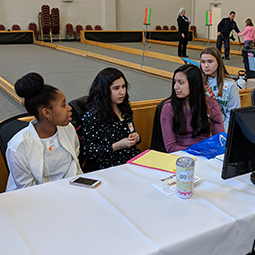 The event was hosted by the Milwaukee Business Journal and featured universities and businesses across the spectrum of STEAM applications, with the goal of engaging young women and promoting access to future STEM careers.